This appetizer is amazingly delicious and so easy to make. You just need BBQ sauce and the secret ingredient. What’s that? Grape jelly. Sounds crazy, but trust me. It’s amazing. Dump the sauce and jelly into the crock pot and stir together. Empty the packages of Lit’l Smokies into the crock pot and stir until they are coated. Put the crock pot on low for 3-4 hours. We love to serve these on game day or any time the family gets together! They are a tradition for us, my youngest calls them baby hot dogs. They are simply delicious! It is a simple recipe, but if you need any help, there is a video below! this is so simple, yet so perfect for a cookout or get together. WE do these and meatballs usually in the crock pot for a perfect snack for everyone to graze on. My mom made these every Christmas and we would literally fight over who got the most! I'm making these as a Superbowl snack where I know they will be just as big of a hit. Love the little video! I don't have a crock pot, but using grape jelly is such an interesting idea! 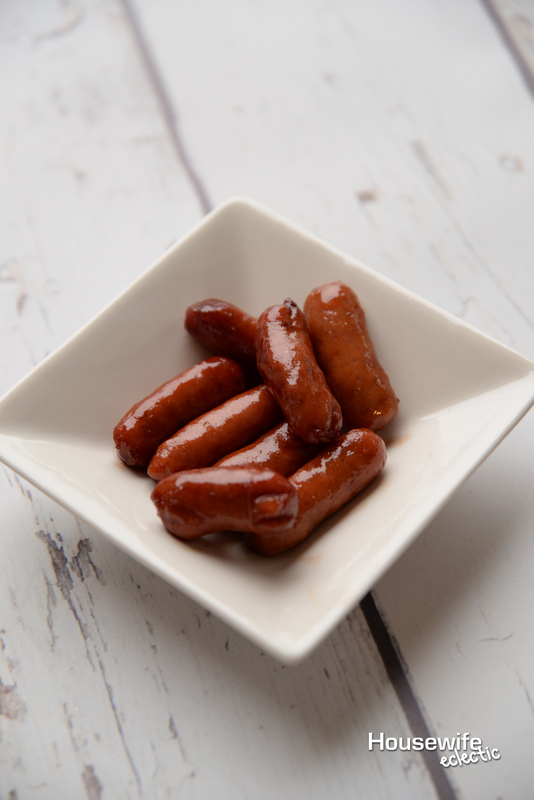 little smokies are one of my favorite party foods! I can't wait to have them this year for the super bowl! I could eat these by the handfuls! They were my favorite snack as a kid! I've been making and eating these for years! It's the best way to enjoy lil smokies and meatballs! I love simple recipes! And this one will be a perfect addition for the game next week! My mom and I were just talking about use a crock pot more. We've sort of fallen out of the habit. This has inspired me to search out some new recipes and get cooking. These look so easy to make but delicious! These will be great to make on a busy weekend for the family to munch on! My in-laws used to make these for the Super Bowl. I thought they were pretty good. I would like to try them again. These look absolutely delicious! I've never tried them with grape jelly before, but I've heard it makes them taste amazing. I'll have to give it a try! These look great! I am all for an easy crockpot recipe because I love something I can leave alone and relax haha. Oh I'm sure these are delicious. My friend made a very similar recipe (jelly and all), but with mini meatballs instead. They were a hit and perfect for the Superbowl party! Now, isn't this a lovely recipe! I like easy crockpot dishes that use very few ingredients! It saves time and money. I'm definitely keeping this recipe! Wow, looks so yum. Such a lovely option for a game day. An awesome recipe to share with friends!